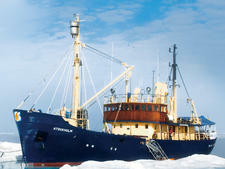 In addition to chartering several ships, PolarQuest operates three of its own ships, including its newest, M/S Sjoveien. Built in Bergen for the Norwegian government in 1964, the ship served until 1995 when it transferred to the Norwegian Coast Guard; most recently it was a hotel ship. Like fleetmate M/S Stockholm, M/S Sjoveien accommodates just 12 passengers and offers expedition cruising in the Arctic around Svalbard. The ship stands out for its wooden decks and vintage details. The outer area of the Main Deck is spacious, perfect for wildlife viewing right from the rail. There is also a viewing platform atop the bridge that affords amazing views. Eight outside cabins -- all with private bathrooms -- fall into four categories. There are four Twin Cabins with portholes and twin beds; two Twin Cabins with windows and twin beds; and two Double Cabin Superiors, each with windows and a double bed. Solo travelers can book a Twin Cabin, but there is a single supplement. While Twin Cabins are a bit snug, they are well decorated in shades of blue and gray. Beds share a single nightstand, but each has an individual reading light. There's also a small writing desk with a chair. Double Cabin Superiors are nicely appointed with night tables on both sides of the double bed, a desk and a chair, as well as an armchair. Tip: For the quietest cabin, book #303, a Double Cabin Superior on the Upper Deck -- the only stateroom on that level. All meals are served in the dining room/lounge on the Main Deck. Breakfast and lunch are buffet-style, while dinner is a sit-down meal served a la carte. You can return to the lounge throughout the day for coffee and tea. Special dietary needs can be catered to, but you must make arrangements with PolarQuest before the voyage begins. Cruise fares include all meals; beverages, including coffee, tea, water and juice; one expedition leader and one guide; all guided shore excursions and onboard talks; comprehensive reading material before the expedition; and an illustrated post-expedition log. The Svalbard Adventure itinerary also includes one night in a Longyearbyen hotel. 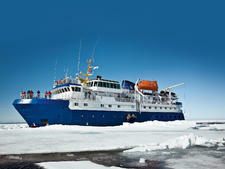 Pick from two Arctic itineraries: the seven-night Svalbard Adventure or the 10-night Expedition Svalbard. In either case, you'll be treated to spectacular views that include snow-capped mountains, glaciers and clear green-blue water dotted with icebergs. Every day, you'll join the expedition team in a Zodiac for wildlife viewing. You might see Svalbard reindeer, polar bears, harbor seals, bearded seals, walruses and Arctic foxes. When it comes to birdlife, look for puffins, little auks, eiders, kittiwakes, guillemots and pink-footed geese. If you're traveling during the Arctic summer (starting late June), you can also expect to see whales and enjoy more landside hikes. PolarQuest doesn't include gear in its cruise fare, so be sure to bring along the appropriate hats, gloves, footwear, parkas and binoculars. The international crew speaks English, but Swedish is also spoken onboard.